King François I built Nieuil as a hunting castle. This 16th-century monarch embodied the romantic ideal of the medieval knight-king steeped in cultivated humanism and the art of the Renaissance. The château later became the property of various titled families. In 1937 the Fougerat family, who have lived in the Charente region since the 14th century, opened it in 1937 as one of the first castle hotels in France. Don’t confuse Nieuil with the town of Nieul, which is just north of Limoges and also has a château! The gracious proprietors, Jean-Michel Bodinaud and his wife Luce, welcome their guests with warm hospitality. Jean-Michel once taught art, and an art gallery on site displays fine art as well as turn-of-the-century posters. Nieuil is 63 km west of Limoges and 42 km northeast of Angoulème Coming from Angoulème on N-141, watch for signposts at Fontafie or Suaux. 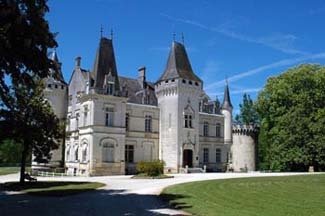 The château is on D-739 between the villages of Fontafie and Nieuil. Public transport is not practical in the area. This lovely white château is everything you could ask for in comfort and elegance. The setting is close to fairy-tale perfect. Symmetrical towers, a moat, formal gardens, and surrounding woods paint a storybook picture of romantic interludes. An imposing marble staircase leads to beautiful antique-furnished guest rooms.The immense rooms are decorated with chandeliers, tapestries, mirrors, and paintings. All overlook the gardens. One outstanding apartment encompasses three floors of an ancient tower. The hotel’s restaurant, La Grange aux Oies, faces the château (it was the château’s former stables) and presents produce from the château’s garden. A fireplace will warm you on cool evenings. The cuisine is excellent. The extensive grounds of the property are a delight to stroll through, and paths lead down to the château’s own lake.